Many people—unhappily, many who consider themselves Christian believers—are so involved with personal concerns and interests that they ignore the obvious governmental and societal intrusions into their lives. Jesus warned believers in response to a question from his disciples, that they should remain alert and watch for the signs he mentions in Matthew 24. There is no room for ignorance. Yet Jesus also noted that, “As it was in the days of Noah, so it will be at the coming of the Son of Man. For in the days before the flood, people were eating and drinking, marrying and giving in marriage, up to the day Noah entered the ark” (Matthew 24:32-29 NIV). The people were involved with totally normal activities which distracted them from exploring and understanding the signs of the times. People were so self-centered that they failed to note the promises of God to set absolute limits on their freedoms. In the present time (2012) believers are inundated with so many concerns that it often seems impossible to keep up with them all. Yet we must, or be in danger of being like the half of the ten virgins waiting for the promised bridegroom—Matthew 25:1-13—who failed to be prepared for the bridegroom’s coming. Of course, we must take care of the multitude of things requiring our attention, but we cannot continue to allow ourselves to be distracted by trivial matters—sports, so-called “reality” entertainment, and such to the exclusion of more substantive matters—world events impacting on our lives. We must depart from Fat, Dumb and Happy Land and return to a place where we hold our leaders responsible for acting in full integrity. We must not go quietly into the night! In AD 64, the city of Rome burned while Nero was the Roman ruler; allegedly fiddling while Rome burned. Most historians agree that while Nero did not literally “fiddle” during the conflagration, his well-known above-it-all attitude failed to organize forces to control the fire which burned for five days. Rumors had it that he may have even been responsible for the arson which started the fire to create room to build his palatial complex. Nero was a narcissist who wanted desperately to be liked by the populous. He devoted government resources to the point of nearly bankrupting the empire to buy the love of the people. Obama on the other hand, employs government resources to enslave the people and make them dependent on government to supply their needs. Most of us are not in positions to provide the leadership needed to correct the plethora of problems our nation and the world faces today. We can, however, as long as we remain a society that elects its leadership, investigate the background and motivation of candidate for legislative positions to determine their fitness to represent us in the governance of our nation. We must send the best qualified, not just the best financed, to Washington to govern our formerly great nation. With today’s Supreme Court decision to uphold ObamaCare, America continues to head toward the fire of economic and social dissolution. The multitude of problems facing the world today distract from the ability to notice the Big Picture. This is consistent with Obama’s employment of the Cloward-Piven Strategy to create chaos to motivate people to accept increased government involvement in their daily lives. So much is happening that the “noise” of life becomes overwhelming. Large numbers of Christians are “trusting the Lord” to make it all come out right in the end. Of course, God’s plan will prevail, but that does not mean that believers should remain complacent and by doing so, become complicit in world events by their inaction and inattention. It is always appropriate to trust in God’s plans as best we can discern them, but we must remember that we each also play a part, however small, in the realization of God’s plan. 2 Chronicles 7:14 reminds us that one of our necessary roles lies in humbly praying, looking to God, and turning from wickedness. If we do this, the Lord’s promise is that He will hear us, forgive our sins, and heal our land. Short of this, whatever will be, will be. Christians can go with the flow or actively take part in turning the corner on challenges faced by the world. While Jesus died on the cross to provide for the salvation of all mankind, each person must accept that work to be a genuine Christian—a definite acceptance is required to see salvation manifest in one’s life. In the 1970s, Jerry Falwell often referred to the “Silent Majority,” speaking of Christians who were not politically active, yet secretly concerned with national and world events. Their silence did nothing to change or constrain events clearly opposing Judeo-Christian beliefs. Christians, as believers we must become active participants in the political freedoms that so many have fought and died to secure for us. Glenn Beck reported today that only 70% of Christians are registered to vote. Are you among them. Go to WallBuilders and see if you are one of the 30%. Get registered. Get active. Get off your duff and encourage others to become active. Become a knowledgeable voter. If the person you think you want to put/continue in office shows himself or herself to have Progressive leanings, beliefs or motivations, remove them from office by replacing them with more conservative candidates. I have been away on a tour of part of Europe for the past two weeks and was forced to leave a gap in my weekly blog. In my previous four-part series entitled, Connect the Dots, I wrote about a number of events and behaviors that are taking place in the American government as well as around the world. As with many of you, I was ignorant of significant underpinnings for those events and behaviors. In 1966, a pair of Columbia University professors, Richard Cloward and Frances Fox Piven, wrote of a plan they felt would improve the status of people living below the poverty line through making them available for government resources and support. 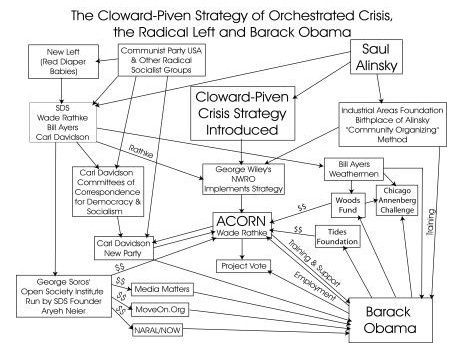 Cloward and Piven developed what has become known as the Cloward-Piven Strategy which has been adopted and advanced by such notables as George Soros, Bill Ayers, and Saul Alinski. The Cloward–Piven strategy is a political strategy outlined in 1966 by American sociologists and political activists Richard Cloward (1926–2001) and Frances Fox Piven (b. 1932) that called for overloading the U.S. public welfare system in order to precipitate a crisis that would lead to a replacement of the welfare system with a national system of "a guaranteed annual income and thus an end to poverty". Cloward and Piven were a married couple who were both professors at the Columbia University School of Social Work. . . . The ultimate objective of this strategy—to wipe out poverty by establishing a guaranteed annual income—will be questioned by some. Because the ideal of individual social and economic mobility has deep roots, even activists seem reluctant to call for national programs to eliminate poverty by the outright redistribution of income. . . Despite the mass media news blackout, a series of books, talk radio and the blogosphere have managed to expose Barack Obama's connections to his radical mentors — Weather Underground bombers William Ayers and Bernardine Dohrn, Communist Party member Frank Marshall Davis and others. 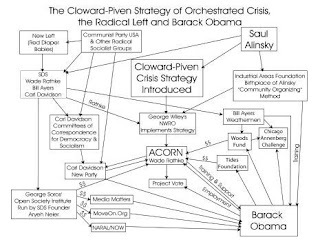 David Horowitz and his Discover the Networks.org have also contributed a wealth of information and have noted Obama's radical connections since the beginning. Yet, no one to my knowledge has yet connected all the dots between Barack Obama and the Radical Left. When seen together, the influences on Obama's life comprise a who's who of the radical leftist movement, and it becomes painfully apparent that not only is Obama a willing participant in that movement, he has spent most of his adult life deeply immersed in it. . . In 1970, one of George Wiley's protégés, Wade Rathke — like Bill Ayers, a member of the radical Students for a Democratic Society (SDS) — was sent to found the Arkansas Community Organizations for Reform Now. While NWRO had made a good start, it alone couldn't accomplish the Cloward-Piven goals. Rathke's group broadened the offensive to include a wide array of low income "rights." Shortly thereafter they changed "Arkansas" to "Association of" and ACORN went nationwide. By advocating massive, no-holds-barred voter registration campaigns, they [Cloward & Piven] sought a Democratic administration in Washington, D.C. that would re-distribute the nation's wealth and lead to a totalitarian socialist state. Barack Obama, the Cloward-Piven candidate, no matter how he describes himself, has been a radical activist for most of his political career. That activism has been in support of organizations and initiatives that at their heart seek to tear the pillars of this nation asunder in order to replace them with their demented socialist vision. Their influence has spread so far and so wide that despite their blatant culpability in the current financial crisis, they are able to manipulate Capitol Hill politicians to cut them into $140 billion of the bailout pie! If we keep in mind the date (2008), one wonders how the American voting public could be ignorant of the type of person being voted in as our next President. Yet, with the collusion of the media, many of the facts have remained “below the radar” in the tsunami of problems heading our way. The facts are out there, if we would only open our eyes and see them! Obama is playing out a script written for him by his mentors: Soros, Alinsky, and Ayers. How else could an unknown non-citizen be able to serve as the leader of the (formerly) greatest nation on earth? A recent article in The Blaze about Cloward-Piven success in Europe cites the impact of this insidious, socialist, communist approach to governing our world. Is Obama Headed Toward Meltdown? With all the current gaffes uttered by our elected, yet ineligible, President, is Barack showing signs of losing it? He openly leaks classified information to make himself look like the consummate world leader and putting American lives at risk. He truly is a man of greatness—at least in his own warped mind. There is so much happening under the radar. Obama is a master illusionist, bamboozling the American electorate with thinly-veiled lies. He is a charter member of the “say it often enough and people will believe it” school—especially when it's reported by the President of the United States of America, blessed be his name! Sycophants will even argue to defend the indefensible. There is a spirit of blindness in our nation today that reminds one of the blindness God allowed Jews to have to enable their denial of the arrival of the promised Messiah. Obama’s reactionary response to conservative statements about the disvalue of current national policies indicates he might be near the ragged edge of his limited ability to lead this nation. United Nations: Forming a One-World Government? A number of UN initiatives suggest that the international body views itself as the foundation of a one-world government for the planet. America is gradually increasing its involvement in these initiatives. One example of this is the shocking testimony yesterday (March 7, 2012) by Defense Secretary Leon Panetta at a Senate Armed Services Committee congressional hearing during which it was confirmed that the U.S. government is now completely beholden to international power structures and that the legislative branch is a worthless relic. President Barack Obama had based part of his election platform on seeking world consensus before engaging in armed conflict. It seems few believed that he was genuinely intending to expose United States interests to the whims of the remainder of the world, many of whom are vehemently opposed to our democratic methods and formerly-successful economy. Just as Hitler bamboozled the nation of Germany between the First and Second World Wars, so Obama has blinded our nation to his intention to push us into the realization of a new socialist state governed by himself as the sole arbiter of what’s right and the bypassing of Congress with its subsequent destruction of our Constitutional system of checks and balances. Obama said he would do this, but few believed him. See the Connect the Dots series. Our President is on the verge of enforcing a treaty that cedes the sovereignty of our oceans to the U.N. courts over which we have no influence. We will also be required to pay one-half of all royalties from off-shore oil drilling to this Marxist international body (the U.N. or its appointed Council). It will be a win-win in Obama’s war on oil. Furthermore, we as a “rich” nation must give away all our proprietary technology about off-shore drilling. The international body will also decide where we can drill. It’s insane! The Law of the Sea Convention or Law of the Sea Treaty (UNCLOS or LOST) establishes a legal regime for navigation and international management of oceanic resources, including the deep seabed. LOST operates under the assumption that any minerals in the ocean floor constitute the “common heritage” of all mankind — and therefore cannot be the property of any one individual, company, or nation. This treaty is an affront to American national sovereignty. It would give the United Nations authority over much of the world’s oceans, including the power to regulate and tax deep-sea mining, and redistribute the proceeds to Third World governments. See the UN Commission on the Rights of the Child for more information on a UN initiative which would disarm the world. Historically, disarming populations has resulted in enabling dictators to rule over and control their people to the detriment of the people.